The electronic group Di2 shares mechanical Dura-Ace’s crankset, chain, cassette and brakes, as before. Plus, there have been some big changes. The old wiring has been ditched in favor of the slimmer, modular, dual-core E-Tube configuration used on Ultegra Di2. This means we now have the option to mix and match the mechanical end electronic groups, so we can expect some value-added options in complete bike specs next year. 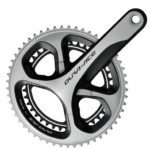 2013 version of Dura-Ace mechanical group is 77 grams lighter than the current generation, Dura-Ace 7900, and makes shifts easier to trigger while improving lever ergonomics. DA9000 is an 11-speed-only group, no 10-speed version is available. There’s a different cable pull for both front and rear derailleurs, so there’s no compatibility between the previous 7900 shifters and derailleurs. 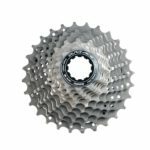 Although the chainrings are the same width as the 10-speed rings from the 7900 group, the chain and tooth profiles on both the chainrings and cogs have been revised for 11-speed. The new four arm design of the crankset puts the strength where most of the pressure comes in a pedal stroke. 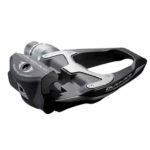 Shimano have been studying the four-arm designs for about 3 years, and testing the rideable samples for about 18 months. Team Sky has been racing with the later prototypes this season. No one has been racing with the new Di2 components yet. Available crankset ratios are: 55/42 – 54/42 – 53/39 – 52/36 – 52/38 – 50/34. 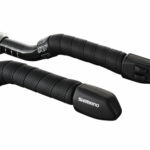 According to Shimano, with the new Dura-Ace 9000 dual control levers, release lever stroke reduced by 30%, shifting effort up to 47% lowered and effort at the end of the lever stroke reduced by 43%, compared to previous ST-7900. 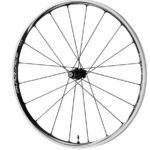 New 9000 also uses Polymer-coated cables for the smoothest shifting. Rear derailleur supports max. 28 teeth of sprocket. Bradley Wiggins won Tour de France 2012 with Dura-Ace 9000. The new Dura-Ace Di2 9070 derailleurs are much smaller and the shifters have larger, wider buttons and they have more wiring ports available. Shimano upgraded the entire system to the newer E-Tube wiring from Ultegra Di2. 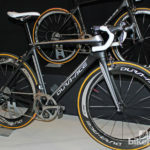 The old Dura-Ace Di2 was a closed system. The new Dura-Ace Di2 9070 is “programmable”. With the new system, for example, you can even program the right shifter to work the front derailleur if you want. You can also program the shifters to simply make the right shifter shift harder and the left shifter shift easier, or vice versa, or really whatever. The new 9070 Di2 also adds Multi-Shift Function like Campagnolo EPS. Shimano also releases E-Tube Project Software. It is a free software and a PC connector is included with the Di2 system. You will get a username and password when you buy Di2, that lets you download the software, but you will need the connector (included in the Di2 package) to do anything with it. There is PC version only, but Shimano working on a Mac version. Both Di2 9070 derailleurs are smaller than previous version and each of the Di2 parts has lost weight. The new shifters have taller shift buttons and they are more distinct than before, to make it easier to shift with thick gloves in winter. Shimano will also be producing a set of single-button time trial shifters. Professional teams came up with the idea of one button per extension, similar to the sprint shifters, both buttons controlling the rear derailleur. The new shifter will be producing with the code ST-9071. 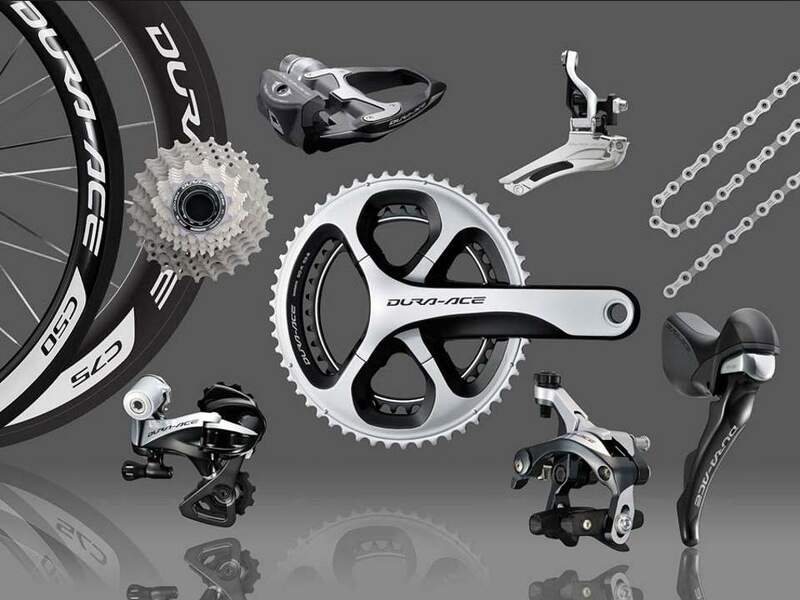 2013 version of Dura-Ace mechanical group is 77 grams lighter than the current generation, Dura-Ace 7900, and makes shifts easier to trigger while improving lever ergonomics. DA9000 is an 11-speed-only group, no 10-speed version is available. There’s a different cable pull for both front and rear derailleurs, so there’s no compatibility between the previous 7900 shifters and derailleurs. Although the chainrings are the same width as the 10-speed rings from the 7900 group, the chain and tooth profiles on both the chainrings and cogs have been revised for 11-speed. The new four arm design of the crankset puts the strength where most of the pressure comes in a pedal stroke. 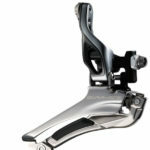 Shimano have been studying the four-arm designs for about 3 years, and testing the rideable samples for about 18 months.